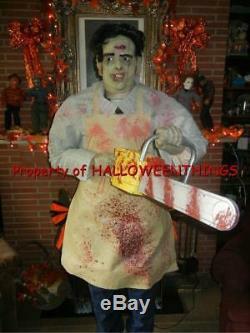 DELUXE ANIMATED 6 FOOT LIFE SIZE LEATHERFACE TEXAS CHAINSAW MASSACRE HALLOWEEN PROP. 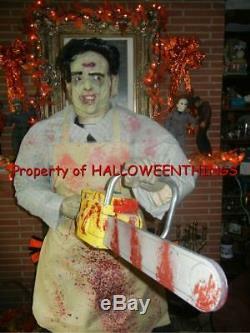 BE THE ENVY OF YOUR NEIGHBORHOOD WITH THIS UNIQUE HALLOWEEN PROP RARE Take a look at this unique: ANIMATED 6 FOOT LIFE SIZE LEATHERFACE HALLOWEEN PROP STORE DISPLAY LEATHERFACE stands about 6 foot tall. LEATHERFACE is so real looking you would think it was a real person standing there. He is electric and is motion and push button activated. 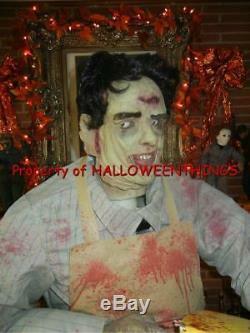 It's a 6 FOOT ANIMATED LEATHERFACE from the movie TEXAS CHAINSAW MASSACRE STORE DISPLAY PROP. I have tested it and (this is what it does). The chainsaw makes sound his eyes move side to side and his arm goes up and down with the saw. His head turns from side to side (but it does make noise) The saw has no chain but it does make the sounds (but not chainsaw sounds). And moves up and down. HIS LEFT SHOULDER IS BROKEN. AND WOULD NEED TO BE REPAIRED. (I DON'T KNOW IF IT IS BROKEN OR I JUST DON'T KNOW HOW TO ATTACH IT). His body does not turn from side to side. How great he would look standing next to your door or fireplace as the trick or treaters come on Halloween night or for that great Halloween party. I do test and describe every piece the best I can......... You don't have to place an order and hope you will get it in a few months. He will compact down to about 36 inches tall when stored in his box. The item "ANIMATED 6 FOOT LEATHERFACE TEXAS CHAINSAW MASSACRE HALLOWEEN PROP RARE (AS-IS)" is in sale since Monday, September 17, 2018. This item is in the category "Collectibles\Holiday & Seasonal\Halloween\Current (1991-Now)\Props". 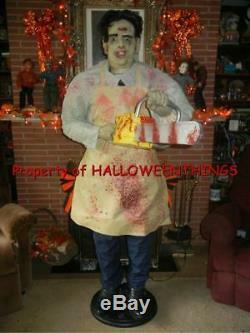 The seller is "halloweenthings" and is located in Prairie du Rocher, Illinois. This item can be shipped to United States.